Last month, construction finished on eight prototypes for President Donald Trump’s promised wall along portions of the border between the U.S. and Mexico. This week, border patrol agents oversaw testing to determine the durability of each option. If completed, the wall will likely cost at least $22 billion and physically define a border where patrol agents are apprehending fewer people each year. This, according to a new pro bono campaign from David & Goliath, is a massive waste of time and money. 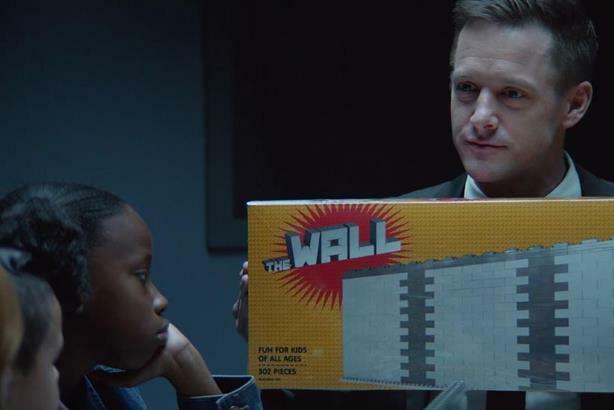 On behalf of Esperanza Immigrant Rights Project in Los Angeles, the agency this week launched the first spot for #BuildSomethingBetter, which harnesses kids’ skepticism to send a strong message about the wall. "It came from frustration and us wanting to have a voice and do our part," said Robert Casillas, a D&G creative director who worked on the campaign. "Trump has put a lot of barriers and walls in between things Esperanza does with immigrants, and this video will create some exposure for their work." In the video, a focus group leader presents several sets of children with "one of the most incredible toys we’ve ever made"—The Wall, a thin, gray slab of plastic that they can build themselves. After poking around disinterestedly at the toy, the kids spout off unscripted takes on what’s in front of them. "You can’t do anything with it." "Why would you just make a wall?" Eventually they dismantle it and reform the bricks into other objects like rocket ships. "We had this moderator talking about how amazing the toy is, and it was cool to see the kids’ brains trying to figure out how to react at first," said Courtney Pulver, creative director and copywriter. "But their natural reaction was to point out how absurd it was." Casillas, who was acquainted with a former member of Esperanza’s staff, brought the idea for a campaign to David&Goliath. "It had always been in the back of our minds to work with them," he said. In addition to raising awareness for Esperanza, #BuildSomethingBetter encourages viewers to sign a White House petition to halt development of the wall. Under the Obama administration, any petition that garnered at least 100,000 signatures within 30 days earned a response from the White House, although the Trump administration has not responded to any that have passed the mark during the president’s tenure. The spot is the beginning of what the D&G team hopes is an ongoing campaign to drive donations to Esperanza, which offers legal resources to immigrants navigating the complex immigration and deportation court systems. Their motto, "Help build futures, not walls," was a strong influence on the campaign, which both creatives stressed is focused on immigration as a human rights issue rather than a political one. "It doesn’t have to be a Republican vs. Democrat conversation," said Pulver. "It’s a human conversation."